We believe that denim shorts can be worn nearly all year round. While you might not pull them out in a blizzard, there’s nothing wrong with styling the shorter jean style with a chunky knit, cropped jacket, or other warmer accompaniments come spring and fall. We also love a winter white, smashing right through the notion that the non-hue can only be touched between Memorial Day and Labor Day. That said, when you mix the two trends together, things start to get a little tricky. White denim shorts? Those are definitely meant for the summertime. Lucky for us, though, ’tis the season. Which pretty much means we’re not taking ours off—ever. You’re probably going to have to pry them out of our iron grip come fall. While we are able to wear them, however, we’re taking full advantage. We’re going preppy with a button-down, blazer, and loafers, edgy with a leather jacket and moto boots, and we love an all-white look, but we equally lust after bright pops of color against the clean palette. With all those outfits in mind, how could we possibly settle on just one single pair? The good news is that we aren’t. We’ve shopped 20 white denim shorts you’re going to fall in love with—at every price point. 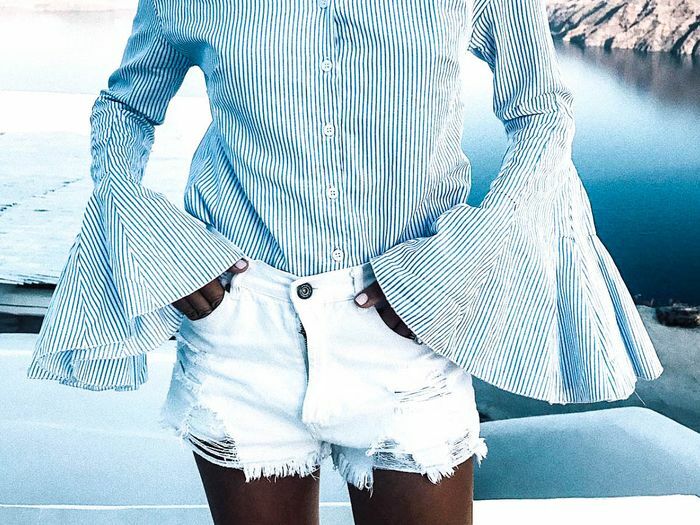 From the affordable pair you won’t mind getting dirty to the ultra splurge you’re definitely going to save for special occasions, here are the white denim shorts we’re loving right now. Available in sizes 16 to 30. Available in sizes 20 to 26. Available in sizes 10 to 22. Available in sizes 26 to 32. Ready to ditch your go-to blues? Brighten up your summer wardrobe with these 20 white denim shorts.